Start plotting your crafty strategy, rally your friends and prepare for a month of geocaching like no other. August is being celebrated by geocachers around the world as the “31 Days of Geocaching.” Find a geocache, log a “Found it” (or an “Attended” for an Event Cache) and earn a unique calendar-style Geocaching souvenir for each day in August. That’s 31 souvenirs up for grabs. Warming up for this month-long geocache fest will take more than planning. It’ll take practice. 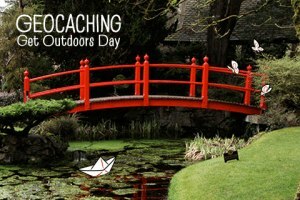 You can get ready for the 31 Days of Geocaching by earning the Geocaching Get Outdoors Day souvenir. You’ll only be able to earn it on this Saturday, July 13. The same rules apply. If you log a “Found it” or an “Attended” on July 13 you earn the souvenir seen in this newsletter for your Geocaching profile. To prepare for this epic challenge, you should tap into some expert advice. Check out the Top 8 Tips for Maintaining Your Geocaching Streak post on The Geocaching Blog about planning for your geocaching streak. Spread the word about the 31 Days of Geocaching to your friends by attending the event on the Geocaching Facebook page. And keep watching the Geocaching Weekly Newsletter for more details about the August adventure, 31 Days of Geocaching.